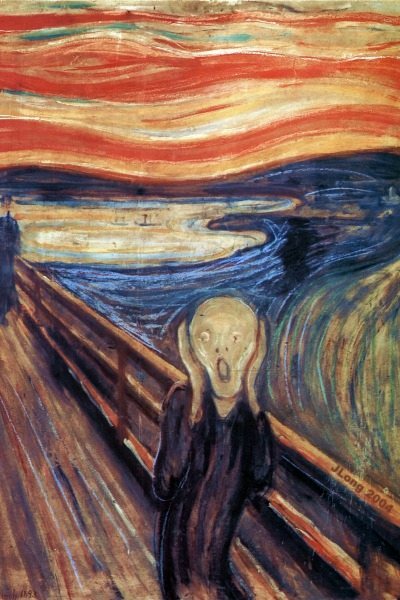 Was Edvard Munch a customer? Did he have a small business loan? A term deposit? Perhaps he occasionally visited a branch. In any case, it’s clear why ANZ went to him for inspiration. It was so obviously time to replace this divisive, confusing, hateful bit of corporate signage that their customers had been railing against for years. I seriously wonder if someone from MC Saatchi had an ANZ account and was out to sabotage them. Noone could, in good faith, design a logo so bad, could they? The internet also compares the new blobs to a pig and a birth canal. Charming. Apparently it took 18 months of research. Seriously, where can I get a job where I can take 18 months to produce that rubbish? I want in. Don’t believe the marketing hype! It has nothing to do with ANZ’s three core markets but actually it’s two tacos underneath a croissant – all steeped in a blue preservative to maintain freshness. Love it. Fantastic. (The Munsch connection, not the logo, silly). I mean, silly bank. But No, no – you are wrong. It’s the “feed the hungry bank with your money or we’ll punch you head in” logo — see how the little hollering human (feed me!) is wearing boxing glove thinggies (or else)? I wub you, I wub you to bits! the effect is just those kinda pancakey things — and you want to scream.